Field Trip Videos from the mineral exploration program. 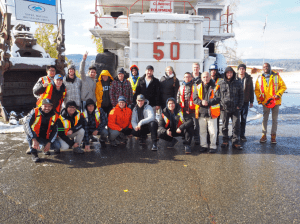 These are our first year field trips from the minerals exploration program, the main objective is to expose us to more practical applications and involvement with the industry. During out first field trip to Merritt, we had the opportunity to visit an actual mine and saw their daily operation. As we traveled across British Columbia, we stopped by some geologically unique spots which showed indication of rare metallic minerals and even coal! On our second field trip to Vancouver Island we visited a Quarry that mines limestone which has many industrial applications. Overall both field trips were very fun, it brought the class closer and we learned so many unique structures that can’t be taught in a classroom. I believe if more programs at BCIT can adapted to this style of learning, we can learn better while having fun!